Three Way Plane is a trio from Greece that has been playing experimental rock music since 2004. There's no other way to describe this sound. It's not stoner rock, it's not emo, it's not mathcore or any of the genres that some people make up to classify their weird music. What Three Way Plane does, will have many people gazing at them with their mouths wide open in disbelief. At least, that's what I expect when this band would release their first full-length album. The effort we have here is a two-track single that's already quite promising and quite surprising. Titletrack 'A Waltz For Unity & Love' can be seen as a heavy blues song with a stoner touch and a lengthy guitar solo. It has a lot of power but I feel people will have to get used to this song. When I heard it the first time I was surprised about it and frankly, I wasn't fond of it yet. However, after a few listens everything falls into place and it gets interesting. The second song 'New Destination' has a higher punk-attitude and is a lot faster than the opener. It's built on a pretty happy sounding lead guitar and it almost ends like a sludge song. This single is just weird, that's for sure. 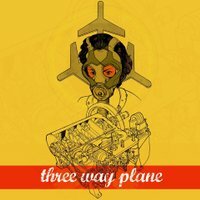 I don't know if it will convince a lot of people into listening to Three Way Plane, at least not on the first listen. However, it does make me curious about the full album that will be coming in the near future. If these Greeks can manage to put as much variation and weirdness into fourty minutes as in six, they're well on their way to become something that will surprise and disturb audiences everywhere.